NOW is the time to take care of YOURSELF! Grow stronger and feel healthier! Explore super-nutritious, immune-enhancing herbs with 40+ recipes you can use to be healthy, right now, TODAY! Take better care of yourself? Reduce symptoms caused by allergies? All information integrates science, herbs and a wide variety of energetic healing approaches including Traditional Chinese Medicine (TCM), Ancient, Shamanic and Traditional healing perspectives. East meets West and ancient meets cutting-edge. Information, materials, and videos about KEY herbs and foods, including Turkey (Huo Ji), that safely support your immune system. Over 40+ recipes using the herbs and foods discussed to help you grow stronger and be healthier. Downloadable Healing Herb Fact Sheets for each food or herb discussed to keep or share with others. You can add your logo and notes to the back. You can enjoy this Be Healthy Series session, any time, any where and go at your own pace, returning again and again to review any material or herb and food you might want to revisit. Be Healthy Series: Strengthen Your Immune System! Join us to explore key herbs, foods and recipes that will help you build immunity and be healthy. Information on building your immune system that integrates science, herbs and a wide variety of energetic healing approaches including Traditional Chinese Medicine (TCM), Ancient, Shamanic and Traditional healing perspectives. East meets West and ancient meets cutting-edge. Information, materials, and videos about KEY herbs and foods, including Reishi (Ling Zhi), that safely support your immune system. 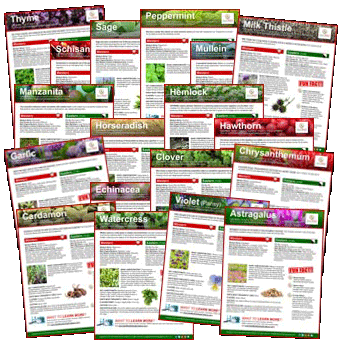 Downloadable Healing Herb Fact Sheets for each herb or food discussed to keep or share with others. Take a Health Series Journey with Us! Our Health Series are completely online. All our materials are designed to be shared with family, friends, and clients. You can add you contact information and logo to the back of our downloadable materials. Once you have purchased this Health Break, you will receive an email with access information. Add us to your address book! 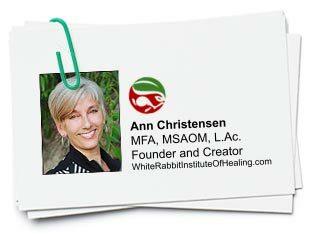 Copy and paste info@WhiteRabbitInstituteOfHealing.com into your email address book to ensure our emails are delivered to your inbox. We are continuously working on new Health Series topics. Do you have a topic you’d like us to cover? Let us know today.